Get the best of both worlds with a MicroPeel – the combination of microdermabrasion and a chemical peel in one treatment! Get the boost you’re looking for to achieve brighter, younger-looking skin. This cost-effective treatment is perfect for clients who aren’t ready to take the leap with laser treatments but still want to revitalize their complexion. Our MicroPeel involves applying a safe chemical irritant to the skin. We then use microdermabrasion to plump the skin and remove dead skin cells, which allows nutrition to be easily absorbed to combat fine lines and wrinkles. After each treatment, dead skin cells will shed without you or anyone else noticing. This simple, safe and effective treatment results in softer, smoother skin with enhanced collagen production. Will a MicroPeel benefit you? Combine 6 treatments for a balanced skincare plan and take advantage of big savings with 20% off on total price. MicroPeel is a combination of chemical peeling and microdermabrasion. 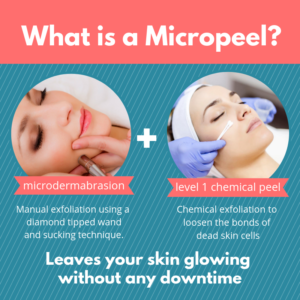 What does a MicroPeel treat? MicroPeel is a great exfoliation treatment recommended as a jumpstarter into good skin health for mature skin as it also treats more aggressive lines and wrinkles. We also highly encourage it in combination with a photofacial as this light based treatment lifts years of old sun damage to the surface of the skin creating excessive dead skin cell build up. What is the difference between a MicroPeel, a chemical peel, a salicylic acid peel, a glycolic peel and a TCA peel? These are all different types of chemical peel solutions used in skincare to assist with correction of certain skin concerns. MicroPeel is the combo of a Level I chemical used in conjunction with microdermabrasion. The TCA peel is a more aggressive chemical peel whereas glycolic peel is best for lines and wrinkles and salicylic peel is best for acne. Is a MicroPeel treatment painful? Many people say microdermabrasion feels good on the skin and the suction assists lymphatic drainage which reduces inflammation. The chemical peel portion of microdermabrasion can feel a bit like a tingle on the face. What are the advantages of a MicroPeel? To soften the skin and make it look much brighter by getting rid of dull dead skin cells on the top layer of the skin. It is a great intermittent maintenance treatment throughout the year. We recommend people get a micropeel alternating with therapeutic facials every 6 weeks. If you do them too often you can strip the skin of the essential oils containing vital nutrients. Am I candidate for a MicroPeel? Almost everyone is a good candidate for a MicroPeel. We only use our Level I chemical peel with this treatment. The only people we do not recommend a MicroPeel is for people with severe acne or rosacea and of course pregnancy.